OS grid reference:- SD 90489 57365. At the foot of Lower Colgarth Hill beside Carseylands road about halfway between Bell Busk and Airton, north Yorkshire, there is a large and prominent Bronze Age burial mound (tumulus), which is close to a footpath and a ruined barn called Allamire Laithe. 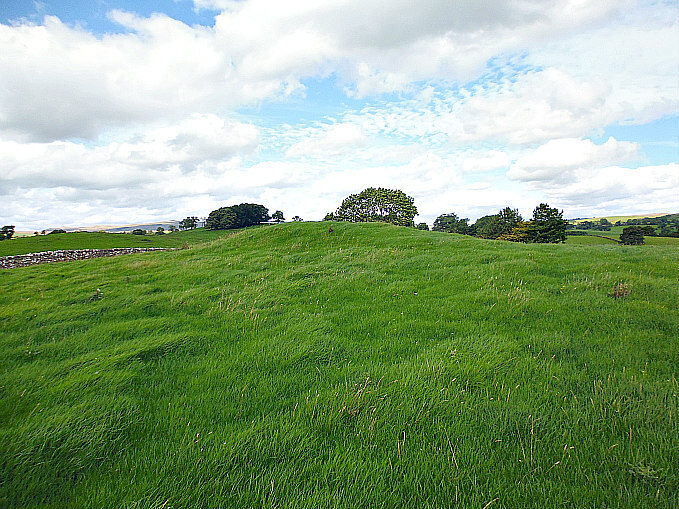 The burial mound is also called a bowl barrow or round barrow in archaeological terms, although this one is more like a long barrow, due to its size. You will also notice, although quite faint at ground level, that there are ancient cultivation terraces in this field and those close by. From here you get a good view over the River Aire. From Carseylands Hill road, at the south-side of the ruined barn, go 48m up the footpath to where there is a small boulder in the opening of the wall, then via off to the south for 35m – and you will soon see the grassy mound in the field just ahead of you. 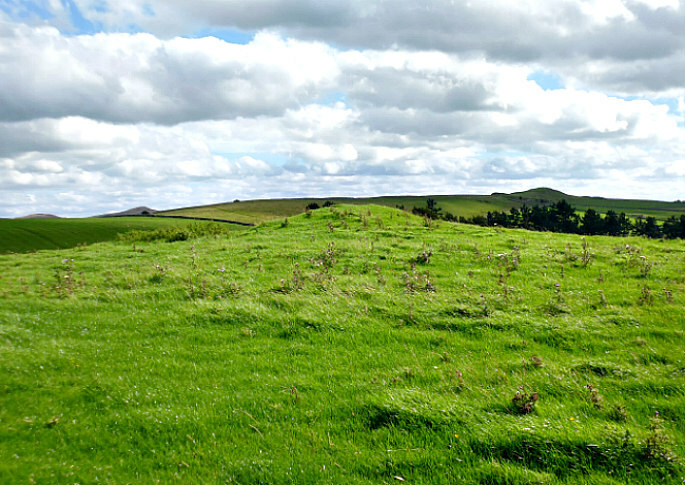 Lower Colgarth Hill, near Bell Busk (and the large, grassy burial mound). 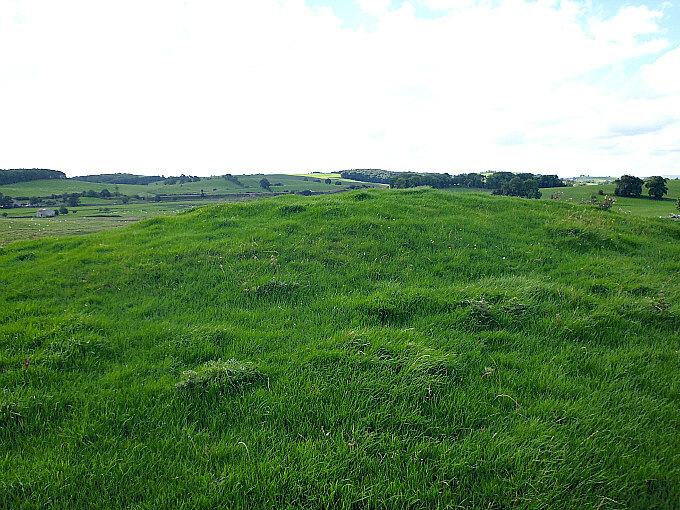 The burial mound (tumulus) here at the foot of Lower Colgarth Hill is rather oddly-shaped, especially at its SW side, where it may have been dug into at some point in the past, although originally it was almost certainly bowl-shaped or bowl barrow-shaped; at a distance it has the look of a long barrow because of this. It measures roughly 11m (36 ft) long and 5.6m (18 ft) wide and is about 5 feet high. This was probably the place where a chieftain or a high-ranking individual of a local tribe was buried – either in the late Neolithic or the Bronze Age. Maybe more than one individual was buried in the mound and, or, quite possibly other members of the chieftain’s family. Lower Colgarth Hill (and the grassy mound). 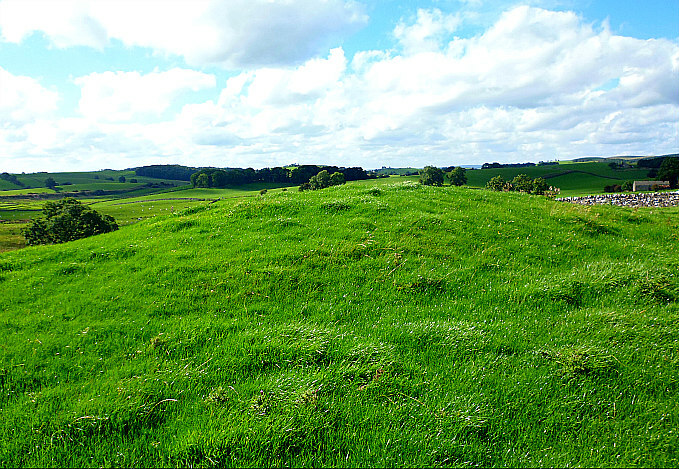 However, nothing more seems to be known about the burial mound on Lower Colgarth Hill – which seems to have been overlooked by antiquarians of the past few centuries, although Harry Speight does mention some other ancient sites in Craven; and I don’t know whether the tumulus ‘here’ has ever been excavated. The cultivation terraces in the same field, and in other fields close by, are obviously very ancient. They are of a similar age, perhaps, to the ancient field systems in the Grassington area, which are considered to be Iron Age. Some cultivation terraces, however, are of a more recent age, probably Medieval? © Ray Spencer, The Journal Of Antiquities. Categories: Burial Mound, Round Barrow | Tags: Lower Colgarth Hill Burial Mound near Bell Busk in North Yorkshire | Permalink.